Reduced height of cut and excessive traffic damage on putting greens result in an increased need for growth leading to an increase in nutrition needs. Tees and landing areas often have higher fertilization requirements than fairways and roughs because they suffer constant divot damage. Fairways and roughs often require lower nutrient inputs than other locations because of their increased height of cut, less damage, and clipping return. Because the use of N and P fertilizers are regulated (see Maryland fertilizer regulations) and are of the greatest concern with respect to water quality, the application of these nutrients is discussed in greater detail below. 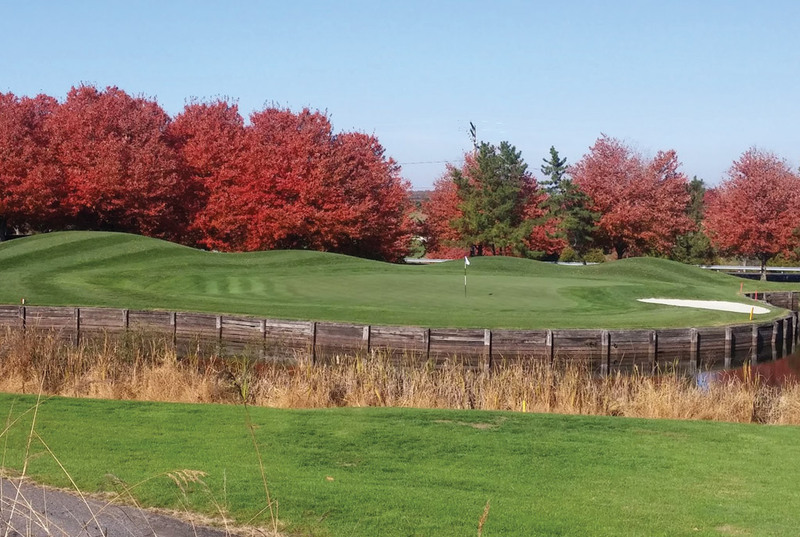 Nutrient management guidelines are published by the University of Maryland (see Nutrient Management Guidelines for Golf Courses in Maryland. 2013. University of Maryland). Rate of fertilizer applied per individual application. Total rate of fertilizer applied on an annual basis. Thus, total annual N application rates should be continually evaluated, both during a given season and on an annual basis. The ranges of annual N application rates typically needed for adequate growth and quality on Maryland golf courses are listed in the table below. These recommended ranges take into account the variability in the factors listed above. For example, rates at the higher end of recommended ranges may be appropriate on sites where clippings are removed, irrigation intensity is high (which increases growth rates and nutrient uptake) and traffic is intense (such as heavily played public golf courses). In some situations, N rates somewhat higher than those listed in the table below are needed in an unusual year to meet the specific conditions and needs of a given golf course or site on a golf course. Rates at the lower end of the recommended ranges are often adequate on lightly or non-irrigated turf that receives less intense traffic, as well as on more mature turf. Some turfgrass species, such as fine fescue and zoysiagrass, inherently require less N to perform satisfactorily in Maryland and may deteriorate when more N is applied than is recommended. It is imperative that golf course superintendents evaluate annually the conditions and expectations at their own courses to determine appropriate rates. *Lower rates for maintenance may be adequate on soils with good organic matter levels, on turf older than five years, for selected cultivars of a given species, and/or on courses with lower than typical traffic. Rates up to 25% higher may be appropriate to maximize the establishment rate during the grow-in period of turf established from seed. Grow-in includes the period from the first mowing of turf (established from seed, sprigs, or plugs) to the date when turf is opened for play. Fertilization of turf established from sod should follow maintenance recommendations. **Irrigated roughs include areas adjacent to fairways that receive irrigation and may have clippings removed, but are maintained at a higher mowing height than fairways. Golf cart traffic may be intense on these areas. The potential for N loss from turfgrass sites primarily occurs when an excessive rate of NO3-N is applied to turf that is not actively growing. Thus, most of the annual fertilizer requirement should be applied during periods of active shoot (leaf blades, rhizomes, stolons) and/or root growth using NH4-N based fertilizers. The primary period for growth of warm season grass species (zoysiagrass, bermudagrass) is from mid-spring, after dormancy has broken, through mid-fall, when the first killing frost occurs. Thus, N applications should generally be restricted to this period. However, fertilizer that contains primarily NH4-N can be applied up to a month before dormancy is typically broken in the spring, so that N is available for plant uptake when growth begins. This can be helpful in the recovery from winter damage and from spring dead spot of bermudagrass. Applications after September 1 are not generally recommended due to the possible enhancement of winterkill, particularly with bermudagrass. However, if bermudagrass has been overseeded with a cool season species such as perennial ryegrass, up to 0.9 pounds N per 1,000 ft2 may be applied after September 1 to enhance its performance. Cool season grasses generally have a longer growth period than warm season grasses in Maryland. They can exhibit growth at virtually anytime during the year if moisture and temperature conditions are conducive. The prime periods for growth on non-irrigated sites are typically from late winter through early summer, and from late summer through late fall. Under extended hot and dry periods during mid-summer, cool season grasses may experience a period of dormancy until rainfall occurs. If irrigation is available or if rainfall is adequate throughout the summer, however, little dormancy will occur and N uptake will continue. Thus, periodic light applications of N (0.1 to 0.25 pounds N/1,000 ft2) during the summer (when traffic can be intense due to high use of the golf course) can be especially beneficial to greens, tees, and fairways to maximize their recuperative capacity. The 2011 Maryland turfgrass fertilization regulations further restrict the timing of application of N fertilizers on golf courses. Between December 1 and March 1, N fertilizers cannot be applied to golf course turf. Between November 15 and December 1, only 0.5 pounds N/1,000 ft2 can be applied, and a soluble N source must be used. Phosphorus is particularly critical for new sites being established from seed, or for overseeding turf during renovation projects. Established turf, however, can generally tolerate relatively low levels of soil P. Potassium is generally more critical on established turf and may play a role in drought, heat, cold, and wear tolerance. Whereas K applications are not regulated, P applications must be based on soil test recommendations. However, there is one exception to the requirement for a soil test prior to the application of P. A soil test is not required if the application is made for the purpose of establishing turf on bare ground, the fertilizer is incorporated, and the application is made in accordance with seeding recommendations. (See Nutrient Management Guidelines for Commercial Turfgrass Seeding. 2005. University of Maryland.) This exception does not pertain to overseeding existing turf. Areas on the golf course that potentially will be fertilized should be sampled every three years. Putting greens and some tees present a unique situation. Due to the very high sand content of most greens and tees, the cation exchange capacity of these soils tends to be exceptionally low and, consequently, the storage capacity for most nutrients is very low. In addition, frequent irrigation (which increases growth rates) and clipping removal result in a fairly rapid depletion of existing nutrients. Thus, soil tests of high sand content greens and tees should preferably be done on an annual or biannual basis to monitor changes in soil P, K, and pH. While soil tests should be taken routinely to monitor soil K levels, experience has shown that K fertilizer rates that are approximately half that of the annual N fertilizer rate are generally sufficient to maintain adequate soil K levels. Recommended rates for P and K applications based on soil tests are shown in the tables below. + Any subsequent applications should be based on additional soil tests. * Or incorporated into soil up to 2 inches. ** Incorporated into soil over a 2-inch depth. ++ 3 pounds P2O5/1,000 ft2 should only be used on soil testing “very low” for P.
* Or incorporated into soil up to 2 inches. ** Incorporated into soil over a 2-inch depth. Follow Maryland fertilizer regulations and use in Nutrient Management Guidelines for Golf Courses in Maryland. 2013. University of Maryland. Identify those areas on the golf course most prone to potential losses or potential impacts on water quality. On highly sloped areas, use slow release N sources and apply a maximum of 0.9 pounds N per 1,000 ft2 per application and avoid application prior to any expected high rainfall. If suitable for the site, use species such as hard or chewings fescue or other species with lower N requirements. Use species with low N requirements in areas immediately adjacent to water. On sandy soils in areas with high water tables, use slow release N sources and apply at a maximum rate of 0.9 pounds N per 1,000 ft2. Apply slow release N fertilizers at the appropriate time of year to maximize release characteristics. For example, an application of slow release N to warm-season turfgrass in fall may not be as effective as the same application applied in early summer because of the prolonged release time in fall. Do not use fertilizers that contain significant amounts of NO3-N on sites conducive to leaching and runoff, such as sandy sites (sands and loamy sands) with high water tables and highly sloped sites or when turf is not actively growing. Irrigate turf after it has been fertilized to bring fertilizer into contact with soil and to move soluble N into the soil. Irrigation intensity must be low enough so that water infiltrates soil instead of contributing to runoff. When feasible, leave clippings. This may reduce annual fertilizer N requirements. Direct drainage systems from greens, tees, and fairways to areas of lower maintenance, such as non-irrigated roughs. Avoid applying fertilizer to soils that are at, or near, field capacity or following rain events that leave the soils wet. Do not apply fertilizers within 15 feet of waterways; or within 10 feet if a drop spreader, rotary spreader with deflector, or targeted spray liquid is used.